A superbly crafted pierced gold Victorian gemset dragonfly brooch from circa 1880-1890. The wings have an elusive and transparent feeling that is further accented by the diamond open settings. The whole insect is paved throughout with old European cut round diamonds of various sizes covering the head, wings, abdomen and tail of the dragonfly. There is also a very fine small Colombian emerald set between the diamond eyes, as well as a small pearl garnished by three rubies placed to the center of the abdomen. There are 72 diamonds with a total estimated diamond weight of about 1.00-1.20 carats. All diamonds have an average G-H color and VS clarity. 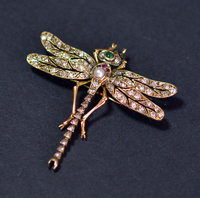 The brooch measures 42mm (1.7”) across wings and about the same from had to tip of tail. Gross weight of brooch is 7.6 grams of 15 karat yellow gold. There are no visible hallmarks or maker’s marks and most likely it was a custom order crafted by a very skillful master jeweler – probably of French or English origin. The brooch is in an absolutely perfect condition. Scarce antique jewelry collector piece and one of the nice and rare Victorian diamond dragonfly brooches and insect jewels.